Levolta Pharmaceuticals is committed to the development of innovative therapeutic products that extend and enhance the quality of life for patients suffering from illnesses associated with rheumatology, immunology and oncology. An integral part of achieving this goal is the conduct of robust and efficient clinical trials at the highest standards of quality attainable. Information on Levolta’s ongoing clinical trials, including information for healthcare providers and patients interested in participating in any ongoing clinical trials, can be found at www.clinicaltrials.gov. 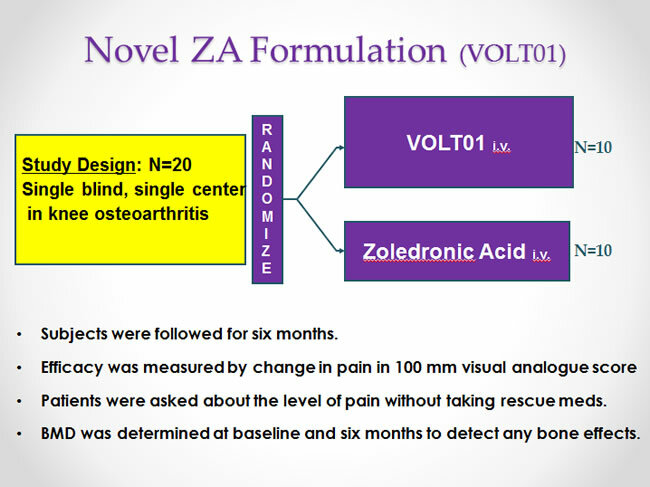 The study concluded that VOLT01 was clearly more effective in controlling OA pain than ZA alone, with the added benefit of no post dosing symptoms. For results, please review our American College of Rheumatology presentation under “Publications”.